A 51-year-old died in Germany this morning following an accident involving a Porsche 911 cabrio prototype. The victim, a Porsche engineer, was driving the car on the A5 Autobahn when he lost control and slammed into a guard rail. The one-car accident happened at 2:45am just past the Weiterstadt exit on the motorway. 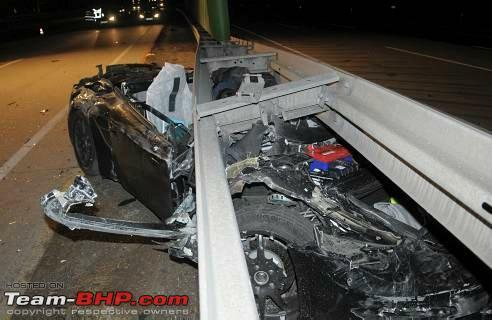 Photos of the scene show the sports car wedged under the barrier, with the rail making contact near where the driver's head and torso would have been. A spokesman for Porsche said the engineer "was one of the most experienced test drivers." The company representative confirmed that the car was a camouflaged cabrio covered with foil to mask parts of the vehicle's appearance. He also noted that, although it did not rollover, the convertible does not have the same resilience as a coupe. Police and fire department personnel responded to the scene from nearby Darmstadt. The public prosecutor there has taken charge of the ongoing investigation. The location of the accident was midway between Frankfurt and Heidelberg, in the German province of Hessen. It is not yet known what caused the accident. Witnesses say the driver, who has worked for the German company for 25 years, was driving a prototype of a new Porsche 991 model at a high rate of speed. That stretch of road does not have a speed limit. He was being followed by a second Porsche testdriver in a camouflaged four-door Porsche Panamera prototype. That driver successfully evaded the crash, and escaped unharmed. Although the accident did take place at an unusual hour, both drivers were working on a 10pm to 6am shift. An initial damage estimate is said to be several thousands of Euro. RIP one of the luckiest guys on this planet. On a lighter note, I HAVe to say this. WHAT A WAY TO GO! I would like to die like this. Crash a prototype Porsche at a zillion miles an hour on an unrestricted stretch of autobahn! As Jeremy Clarkson says, you need to go through the pearly gates backwards on fire!! Oh man! He must have been doing close to 300 on that road. No matter who, what you drive, how you drive, where you drive, when it's time, you've gotta go! Thats a real bad crash. The whole car is crushed under the railing. Very sad to see such an experienced driver go. RIP brother. Man this is bad! I am kindda surprised by the guard rail design though. Generally its designed to stop cars and not make then go under. May he rest in peace. And may the driver following him have the strength to get over this. Looking at the pics, must be gruesome. I agree with you Mohit, the guard rail should have been lower so that the bumper would have hit it avoiding the car from going under it at this kind of a speed. I don't think they bring the rails down as the cars go lower and lower. This is where a BRICK like design helps. Oh my god! Thats Scary! The barrier looks wierd and dangerours..not the usual armco. Any car can get its roof chopped like a guillotine. I am guessing that you are no more than 16 years old. The guard rails look dangerous even for a normal height sedan. Last edited by srishiva : 13th February 2009 at 23:15. So unfortunate! May his soul rest in peace!